While your cat is staying with us, they will receive plenty of tender loving care. 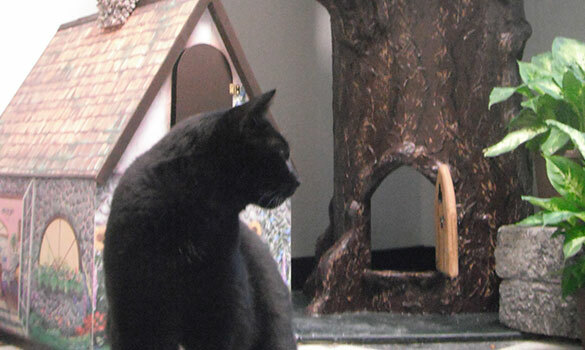 Our cat boarding accommodations are located within to our main office, separate from the dog boarding facility. Whether your kitty is shy or outgoing, nervous or social, we have an accommodation perfect for their stay. Shy or nervous cats will prefer our private Kitty Condos. More social kitties will love the unique cage-free boarding in our Kitty Playroom Suite. Both types of rooms include fleece perches for sleeping and climbing, litter box, and food and water dishes. They can use our toys to play or feel free bring one along from home! Our resident cats Mr. Buttons and Mama Kitty might stop by to pay a visit and make friends. For your pampered feline, opt for a coat brush, nail trim, daily treats, or other add-on services. Climbing a huge realistic wooden tree with padded soft perches among the branches and a fairy door leading to a secluded nook. Stalking the cat walk that encircles the entire room eight feet in the air!